Rite Aid's Q1 earnings were hurt by the slow ramp-up of its new drug sourcing agreement with McKesson. Earlier this month, Rite Aid (NYSE:RAD) reduced its guidance for the 2015 fiscal year (which ends next February). The company stated that reimbursement rates for prescription drugs declined faster than expected, while its partnership with pharmaceutical distribution giant McKesson (NYSE:MCK) did not ramp up as quickly as expected. Rite Aid stock has run into serious turbulence since this announcement, declining almost 20% from the multiyear high it hit just a few weeks ago. 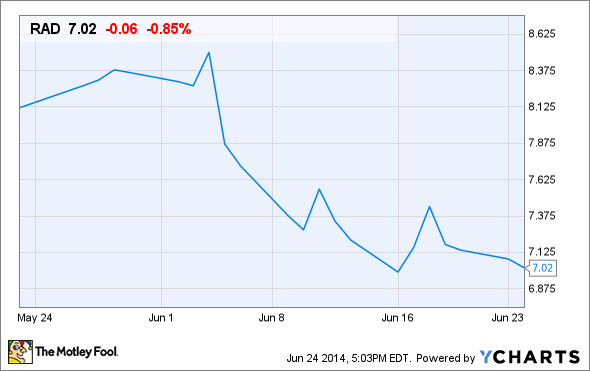 However, Rite Aid provided more context about its Q1 earnings disappointment last week. The key takeaway is that the main drivers of its profit decline were one-time in nature, and earnings growth should resume later this year. $100 billion of annual drug distribution revenue, giving it purchasing scale advantages. By contrast, Rite Aid has annual revenue of about $26 billion, of which roughly two-thirds comes from its pharmacy counters. That makes it a significant buyer of drugs even by itself, but it is still at a qualitatively different scale on its own compared to its combined scale from working with McKesson. Rite Aid's partnership with McKesson will have a second benefit -- it will reduce the company's working capital needs by $250 million. McKesson will deliver both brand-name and generic drugs to Rite Aid stores on a daily basis. This will allow Rite Aid to carry less inventory. That frees up $250 million of cash that can be used to pay down debt, reducing interest expense. Despite posting revenue growth of 2.7% last quarter due to same-store sales growth in the pharmacy department, Rite Aid's net income fell by more than half. The key driver of this profit drop was a decline in gross margin of roughly 1 percentage point. This in turn was primarily the result of lower pharmacy margins. Rite Aid's management had hoped to start reaping benefits of the McKesson partnership last quarter, but it is taking slightly longer than expected to implement the new sourcing arrangements. At the same time, Rite Aid is facing stronger than expected pressure on reimbursement rates from pharmacy benefit managers. In fact, Rite Aid's switch to sourcing drugs through McKesson actually aggravated its pharmacy margin decline last quarter. In the past, Rite Aid has been able to negotiate with its suppliers to reduce drug costs when it was facing reimbursement rate pressure. However, since Rite Aid is on the verge of terminating those relationships, its direct suppliers have no real incentive to offer lower prices. Fortunately, the problems that Rite Aid encountered last quarter are short-term in nature. By the second half of this year, Rite Aid should be fully transitioned to buying drugs from McKesson. McKesson's massive purchasing scale should allow it to provide better pricing than Rite Aid could ever have achieved on its own. The reimbursement rate pressure that cut into profitability last quarter will certainly continue, but Rite Aid will be in a much better position to offset that revenue pressure with lower drug costs. In other words, Rite Aid's poor Q1 earnings report does not imply that the company's turnaround is off-track -- it is more likely a blip on the radar screen.